For The Love Of Music. The Next Step In Entertainment. Global luxury brand, Ferrari, chose David Wiener Collection to create the first ever Ferrari home audio system: Art.Engine - an audio and engineering tour de force. Following in this tradition of innovation and exquisite execution, David Wiener Collection has created a new music listening experience that will change the way you approach your music. Imagine being excited every time you hit the power! A Complete Music System. Two Towers. No Installation Required. Art.Studio combines twin speaker towers, built-in digital amplifiers, DSP and optional DWC•Wireless music reception, along with the recording industry’s most effective audio enhancement technology - DWC•Aphex™ - in an elegant and architecturally inspired design that creates instant excitement and envy in all who are lucky enough to experience the advanced musical performance that is DWC. 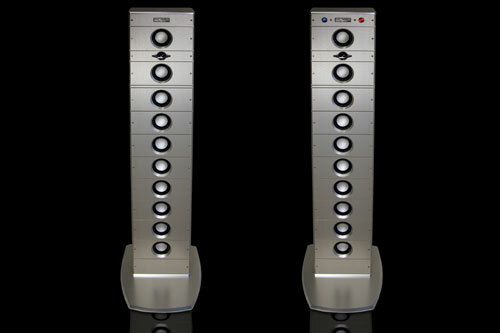 Art.Studio creates a room-filling sound field of high-definition stereo entertainment from its matching towers. Taking DWC innovation and engineering to new heights, Art.Studio’s performance is outstanding. “The music comes back to life,” “clear” and “spacious” and “extremely even sound from the front to the back of the room” are some of the words listeners use to describe the Art.Studio. Clearly, Art.Studio’s every detail exhibits the passion and elegance influenced by both David Wiener Collection and Ferrari: machined from solid aluminum plates, the all-aluminum enclosures, speaker arrays and superior electronics combine to deliver an extraordinary sonic and visual performance while provided extreme ease of installation and use. With multiple input options and a subwoofer output, the Art.Studio makes it easy to enjoy your music, your way - without limitations on placement, wire runs or a large footprint. The Art.Studio also incorporates a critical new acoustic technology brought to the consumer electronics world for the first time ever by the DW Collection. 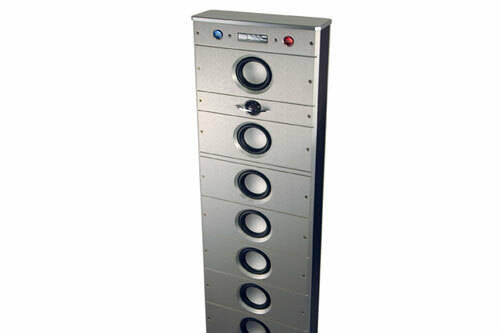 First developed for the recording industry, and used by top recording artists and engineers like James Taylor, Fleetwood Mac and Paul McCartney in mastering their albums, the DWC-Aphex circuitry makes recorded music more “alive” by restoring the harmonics lost in compressed music files and providing incredible spaciousness and clarity so that each instrument and voice is clear and distinct. At the same time, bass frequency response is optimized, providing deeper and more resonant bass with the fullness, richness and depth that will make all your audio input sources sound more powerful, dynamic and intelligible. 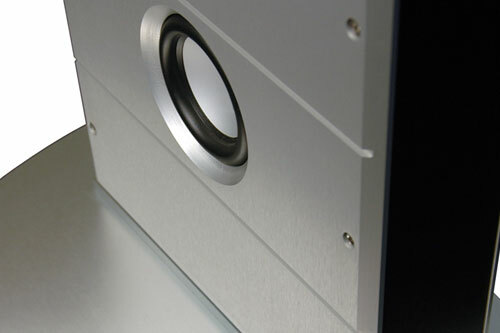 Unlike an equalizer or bass boost circuit, DWC•Aphex restores and improves bass without creating muddiness, or increasing the amount of amplification needed or increasing the listening volume. DW Collection continues to advance the art of audio reproduction with 2-way wireless technology that provides the highest level of audio quality wireless performance with no dropouts. Art.Studio’s optional wireless transmission technology allows users to transmit any audio source to the Art.Studio, including iPod, computer, CD player, MP3 player or satellite radio. Sending a streaming audio signal wirelessly from point A to point B is no easy task. Ensuring that the signal arrives interference-free each and every time and without degradation in audio quality is a monumental challenge. Airwaves today are cluttered with signals from electronic devices such as cordless phones, radio controlled toys, cell phones, microwave ovens and wireless routers. DWC has perfected wireless audio technology through the use of proprietary frequency hopping spread spectrum (FHSS) transceivers. DWC’s FHSS is the most robust wireless transmission system available for audio systems, and dropouts are now a thing of the past. David Wiener Collection is dedicated to advancing the state of audio entertainment in the hopes of showing the utmost respect to the musicians and artists who create so that we may enjoy their work. DWC continues to engineer and innovate products and technologies so that you can hear exactly what these artists intended as they set out to record their masterpieces. We hope you will join us in supporting the great and creative individuals who give us the one universal language and art: music. Join us as we Respect The Music! Digital Power • DSP • DWC-Aphex© Audio Enhancement • Optional DWC-Wireless™ With Zero-Drop Technology Multiple Inputs • Sub Out • Machined Aluminum Construction • Two Towers Means Twice The Fun!